When Ambassador Clarence Rodman (Scott) – who probably isn’t related to basketballer/honorary North Korean Dennis Rodman – is on a speeding train somewhere in Kenya, things start to look bad. Little does he, or anyone else, know that super-evil terrorist mastermind Jafari Bin Kasim (Caprari) is on the loose. So, naturally, the DELTA FORCE is sent in. Let by Captain Kennedy (Thomas) and Sgt. Johnson (Jensen), the boys get involved in endless firefights and bombings in and around Kenya. When certain people are held prisoner by Jafari – who probably isn’t related to the bad guy from Aladdin – Kennedy wants answers, but he’s not getting any info from the military brass. 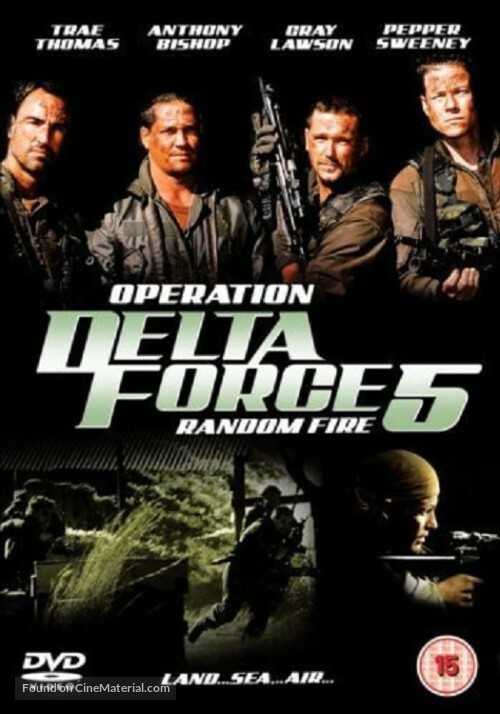 After a wave of suicide bombings in America, the DELTA FORCE decides to go back to Africa to save their missing compatriots. Will they hit their mark? Or will it just be a bunch of RANDOM FIRE? 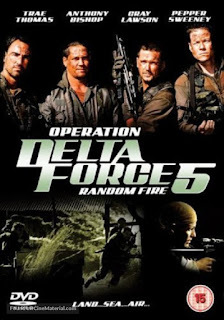 OPERATION DELTA FORCE 5: RANDOM FIRE is a cross between a generic and characterless Nu Image modern-day war actioner and a movie that can predict the future. 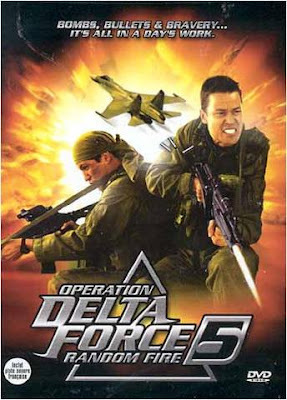 Sure, there are the endless, repetitive shooting/blow up scenes we’ve all come to expect, but let’s keep in mind this has a copyright date of 1999 and was released in 2000 – and it features a terrorist using a plane to crash into something as a weapon of war, there are many sleeper cells and suicide bombings, and there is a Boston bombing. All pre-9/11. So, pretty impressive for a DTV war movie with nothing else to distinguish it. …among other rather obvious clues. The movie needed more Jafari. And even during the Jafari we did get, most of Jafari’s face is obscured by bizarre and unneeded close ups while he’s looking through binoculars and singing “Glory, Glory Hallelujah” as the signal to ignite his suicide bombers. While he was onscreen, at least there was some mild tension and/or lack of boredom. But the filmmakers must have thought audiences would be okay without him. In classic B-movie fashion, all the people we see look like other people. Is that Anthony Michael Hall? No, it’s Trae Thomas. Is that the guy from Seinfeld? No, that’s…someone else. Is that Todd Jensen? No, that’s…Todd Jensen. After seeing many movies with him, we’re still not sure what he looks like. While there are a lot of war clichés, there are also plenty of things action movies used to have back in the good old days: exploding helicopters, guard tower falls, guard tower explosions, repeated footage, borrowed footage, and stuff like that. But it’s not enough to make the movie interesting or worthwhile. Some characterization might have helped. Just a thought. However, our favorite character comes along towards the end of the movie. We don’t think he has a name, but we could be wrong. He’s a guy shooting a machine gun out of a helicopter. The top half of his face is obscured by his helmet visor. He displays no emotion whatsoever, never says anything, and never changes his body position or his gun position. He’s just an unsmiling, seemingly random guy with a gun who can’t be bothered to do anything else. It was pretty funny…if you ever see this movie, lord help you, you will recognize him based on our description, we’re sure. Oh yeah, one more thing. Please allow us to quote from the back of the TVA Films (Canada) DVD box. It says, in part, after attempting to describe the plot for a few sentences: “The inquiry is interrupted when news arrives that the three men left behind are now being held prisoner in Angola by terrorist Osama Bin Laden.” Wait a minute. Are they allowed to do that? We were led to believe old Osama himself would make an appearance in this movie. So, naturally, like any sane individual, we purchased the DVD at the library store for two dollars. It could just be that the box-writer was confused by the actual baddie’s name, Jafari Bin Kasim, but the only similarity is the “Bin”…which is exactly where this godforsaken DVD should rightfully go. We kid, of course, but no Osamas are to be found. The main selling point is a sham. That’s classic exploitation for ya. Well, anyway, best just to avoid this movie and move on with your life. In Turkey at some point in the historical past, armies are fighting. When King Solomon (presumably not the biblical one) is killed during one of the conflicts, his son is spirited away to safety in the forest. While there, he is raised by lions and develops awesome strength. Of course, the new regime is still in place. Lionman, as he becomes known, develops friends amidst all the turmoil and intrigue, and they are in trouble. During a fight, Lionman’s hands are burned with acid, so he asks the local blacksmith to make him a pair of iron claws. That’s when he really gets mad and goes out for revenge. Who will win, the SWORD or THE CLAW? THE SWORD AND THE CLAW is a ton of fun and highly recommended. The last time was saw anything from Turkey, it was Cellat (1975). But, rather than be a “Turkish Death Wish” as that film was, ‘Claw is more reminiscent of The Devil’s Sword (1984) from Indonesia. It’s a wild, wacky, and dare we say exotic adventure. Arkin plays a nonverbal Tarzan crossed with a hulking, violent Zorro. And it’s all filtered through that lens of Turkish films from the 70’s that seem quite bizarre to our modern-day Western eyes, and that provides a lot of the entertainment value. Of course, it has funny dubbing and messy edits as befits a drive-in-style movie. We wouldn’t want it any other way. There are also some colorful sets and many characters have some pretty fantastic headwear. Lionman sports wicked fighting moves and the ability to seemingly defy gravity with his powerful jumps. Before ‘Claw, the killer from Blood and Black Lace (1964) had a spiked glove, and after this movie, there was the guy from The Glove (1979), and Freddy Krueger of course, but Arkin may be the first in movie history to have two spiked gloves, and what he does with them is downright impressive. It’s a new kind of silly/violent swashbuckling. It works well in the atmosphere of arrow shots and sword slices. Thank goodness for AGFA, who released this gem on Blu-Ray. We’re lucky to see it, and it seems they rescued this movie from oblivion. Or, at the very least, they made it easy for the rest of the world outside of Turkey to see it. 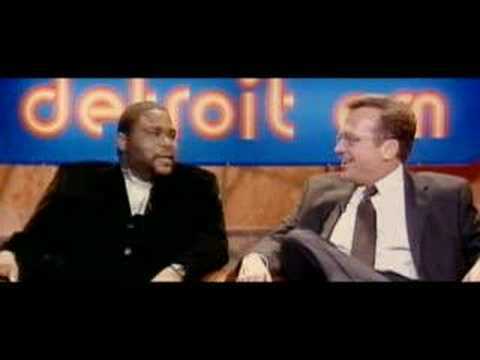 If you’re not familiar with them, check them out at americangenrefilm.com. 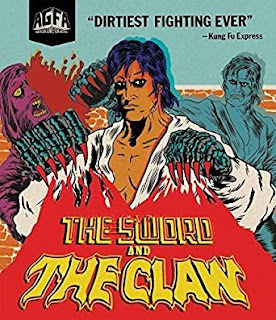 Anyway, for those interested in the more peculiar and/or foreign end of the action spectacular, The Sword and the Claw is a satisfying watch and a worthy addition to any Blu-Ray collection. 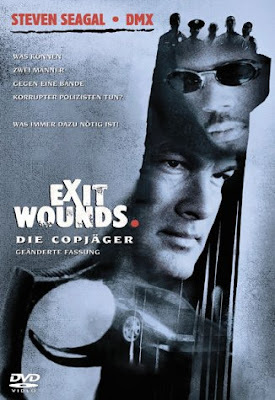 Boyka (Adkins) returns after a six-year absence in this fourth installment in the Undisputed series. At this point in his life, Boyka has found religion and he spends his time and money at the local church. However, he still lives to fight. This causes tension between not just Boyka and his friend, the Priest (Mihailov), but within himself as well. When Boyka’s agent informs him of a big tournament in Budapest that all his fans, and the media, are waiting for, Boyka senses this will be a big opportunity for himself, so he gets all hyped up. So much so that he accidentally kills his opponent in the ring in the qualifying match for the big show. With his conscience weighing on him, he makes a dangerous and illegal journey from the Ukraine to Russia to meet his now-deceased opponent’s widow, Alma (Duhovnikova). He tries to tell her how sorry he is, and he attempts to give her his fight winnings, but it’s tough going for them both. The sad part is, Alma needs the money. She’s deeply in debt to local crime boss Zourab (Aboutboul) because she used his money to build a community center where all the children go. She can’t escape because then she’d be letting the children down. She’s slowly working off her debt to the unscrupulous baddie by waitressing at the club where, of course, there are fight tournaments. Boyka approaches Zourab and offers to fight in the tournaments to pay down Alma’s debt for her. All the while, the pressure is on because he has to get to Budapest for his big chance. But first he has to get past terrifying man-mountain Koshmar (Ford). Now that Boyka has found redemption with the Lord, will he find redemption with Alma? With Undisputed IV, we have a bunch of winning elements that all come together. Firstly, and most importantly, we have the great Scott Adkins putting in a terrific performance as Boyka. There is perhaps no other actor working today that could have done what Adkins does here. He has a great Ukrainian accent, his fighting skills are in top form, and there’s plenty of emotion as well. It’s rare that one person can embody both the impressive physicality and the inner feelings Adkins does here. It’s extremely well done. Then we have the other actors backing him up, who also put in fine performances, we have the plot, which allows for not just bone-crunching action but also the aforementioned emotion, and of course the fights themselves, which are very well-executed. As far as the fights go, we can see all the moves and there isn’t all that fast cutting that can be found in many DTV Punchfighters. With Adkins, that sort of stuff isn’t needed – and, in fact, hinders what you can really see him do – and thankfully the filmmakers realized that this time around. A rather strange and unnecessary zoom effect is used in fight scenes and dialogue scenes alike, but it apparently isn’t used to hide anything, instead it seems to be a stylistic choice. Besides not being needed, it marked this out as being a modern-day DTV vehicle, but it didn’t hurt our eyes or anything. Naturally, the word “Boyka” is said countless times throughout the movie. We could be in triple digits here, but we weren’t counting. Characters say it constantly, and crowds chant it repeatedly. It might be the most oft-said word on screen since Brakus. Or perhaps Malone. 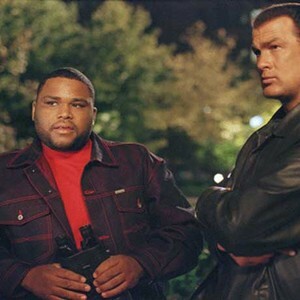 But, all kidding aside, Undisputed IV is a movie about redemption, and about how even if you’ve done unfortunate things in your past, you can always redeem yourself in the eyes of God or your fellow man. It’s never too late. Even the name of Alma gives a clue – it means “soul” in at least two languages, and Boyka himself gives alms to his church. This gives the film a certain depth and dimension that sets it apart from others of its ilk and it’s not just a marathon session of meatheads punching each other. However, if that’s what you want, that is here as well. It’s truly a movie of multiple facets. 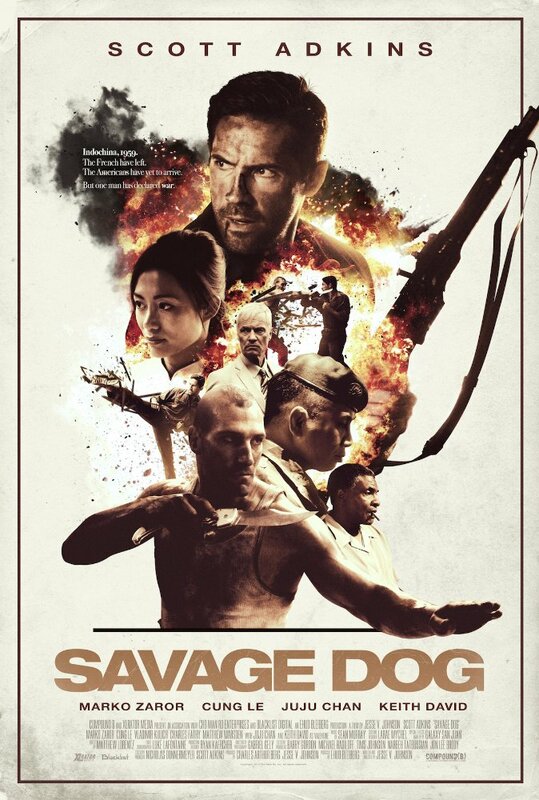 Could this be the best Boyka film yet? Please write in to give your opinion. But one thing is for sure: the character of Boyka – as expertly interpreted by Adkins – has become so beloved because he’s a fighter with a heart, soul, and conscience. You feel his inner conflict between peace and violence. Somehow this speaks to us as action fans. We don’t want to see anybody on-screen – or be ourselves – one-dimensional. He even has his name above the title this time, and that’s no coincidence. So, for a movie with a lot of brutal fighting – but also some depth backing it up – Boyka: Undisputed IV fits the bill perfectly. Martin Tillman (Adkins) is an Irishman and expert fighter. His rise to the top of the fight game is severely hampered by the fact that it’s 1959 and he’s in an Indochinese forced-labor camp. So he survives the only way he can - by becoming the number-one champ in the brawls that are held within said camp. These fights are held outside, so all the locals can see them, and Tillman becomes extremely popular. 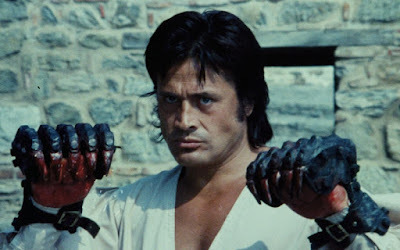 So much so that when it comes time for him to be released, the cadre of baddies that run the camp – Rastignac (Zaror), Steiner (Kulich), Boon (Le), and Amarillo (Fathy) – don’t want him to leave. Of course, Tillman does indeed get out of there but he stays in Indochina to work at a bar run by his buddy Valentine (David) and his wife Isabelle (Chan). Naturally, trouble starts when the baddies don’t leave them alone. After something happens (we won’t say what; no spoilers here), Tillman is forced to go on a rampage of revenge against his former captors. As if all that wasn’t enough, he’s also being trailed by a British government agent named Harrison (Marsden) for his supposed former connections to the IRA. Luckily, Tillman was trained to fight locally by a Tribal Chieftain (Aleong). Will Tillman get revenge and show he’s a SAVAGE DOG for the last time? Thank goodness for Scott Adkins. He really is keeping the flame of the golden age of action cinema alive and burning. If it wasn’t for him, where would we be today? We’d have to fall back on the films still being made by the prior generation of action stars that are still working. Not that that is such a bad thing, but, let’s face it, Adkins has the vitality that some of the older guys naturally are losing over time. It’s fun to watch Adkins because he’s likable and has killer Martial Arts abilities. That formula is necessary for a truly great action star, so it’s no wonder he works so much in the DTV industry. He’s one of the very few men of action out there still left, so of course filmmakers are going to use him if they want to make this type of movie. While Savage Dog is indeed a Punchfighter/Revenge Movie, we applaud the filmmakers for at least giving it a setting that is different – the fifties and the former Indochina. That was a nice change of pace. Adkins and David have a nice chemistry together, and the fights overall are executed very well. The whole second half of the movie is simply Tillman getting revenge. That’s what’s good about DTV as opposed to Hollywood – you know they aren’t going to wuss out and revenge will be appropriately violent and bloody. Nowhere is that more true than here in Savage Dog. For whatever reason – maybe it’s to further separate itself from its competitors even more so than its chosen time and place – writer/director Johnson decided to go not just with the standard action violence, but gore as well. While we certainly weren’t offended by it, it just seemed a little unnecessary. Rather than have limbs and heads being graphically chopped up and mutilated, maybe they could have concentrated a little more on the final fights between Adkins and Le and/or Zaror. If they extended each fight by 30 seconds instead of gore-ing it up, that would have fit the bill just fine. But as it stands, it makes Savage Dog something of an oddity. 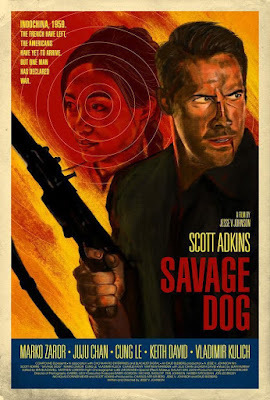 A movie that surely lives up to its name, Savage Dog is perfect for Adkins fans, and nicely narrated by David. We say check it out.